One of the most successful parenting hacks to help sooth the baby to sleep is to take baby for a car ride. This is also one of the most dangerous hacks because it puts a number of overly fatigued drivers on the road. 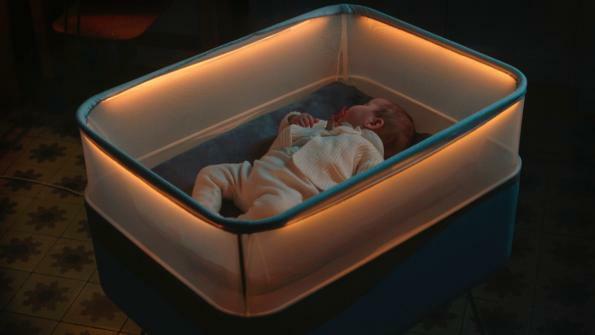 In an effort to combat this danger, Ford’s Spanish design studio Espada y Santa Cruz developed Max Motor Dreams – a stationary cot that simulates a car’s sounds, motion and lighting to lull baby to sleep. Per Wards Auto, the parent collects the sensory elements of the ride via a smartphone app and transmits them to the cot, which combines low engine sound, a gently rocking motion and surrounding LED lights simulating passing streetlights. While this unit is a one off pilot, Ford has said that it has received numerous inquiries about the product and is considering moving it into production. A hack we tried when Lil’ G-Man was small, was strapping him in the car seat then placing the car seat on the running laundry dryer. It is a trick that worked for some of our friends but unfortunately failed for us because we have too efficient of a dryer. Although we did have good success with the 4 Moms mamaRoo baby swing. It has 5 unique motions that mimic how parents move the baby while holding him, as well as various audio settings. Previous How Close Did Joe Manganiello Come To Playing Superman In “Man Of Steel”?